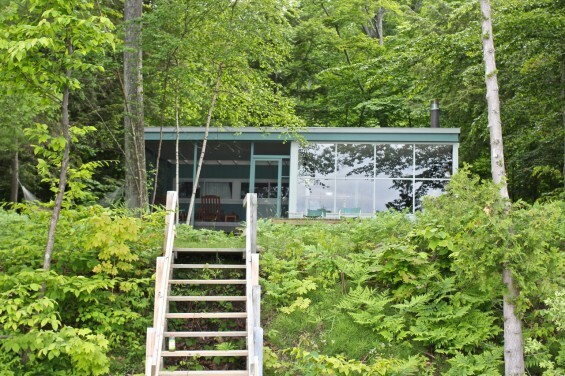 I’ve wanted to stay in this Michigan cottage designed by the notable Chicago architect Harry Weese for a few years. 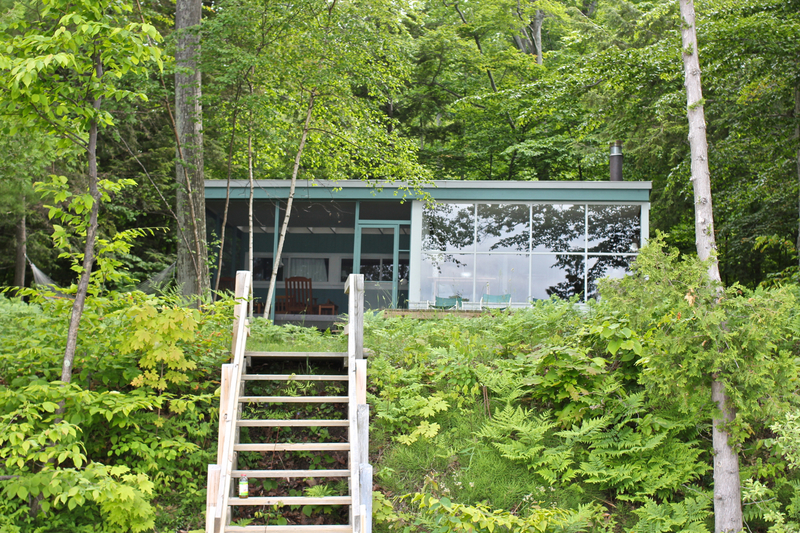 Tucked into the wooded shores of Glen Arbor just a few minutes from Sleeping Bear Dunes–arguably Michigan’s most popular summer tourist destination–sits another, far more secretive jewel: a trifecta of summer lake houses Harry Weese designed in 1938-39. 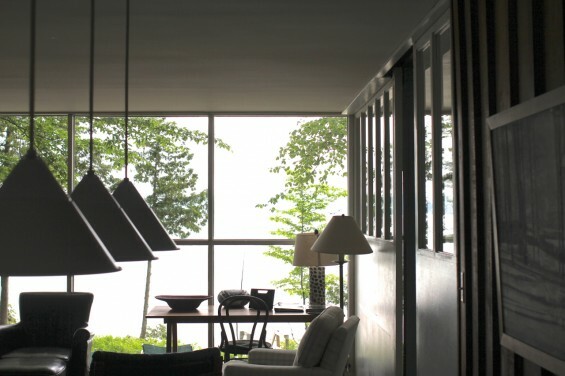 He had a fondness for Michigan, perhaps due to the natural beauty of the Northern Michigan, where he vacationed with his family in 1936, or the fact that he went to architecture school at Cranbrook Academy, where he befriended like-minded designers like Charles Eames and Eero Saarinen. 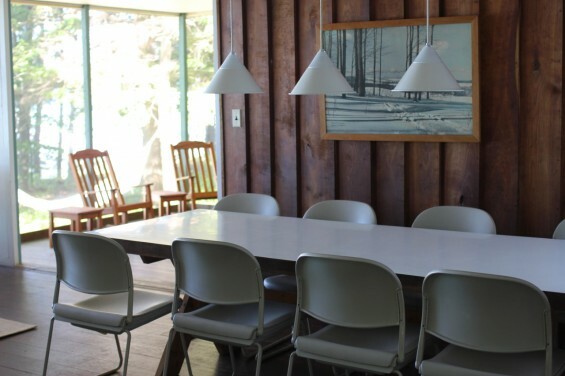 These days, the original two Weese family lake houses are rented out, giving lucky guests the chance to experience Weese’s genius first-hand. In the woods. 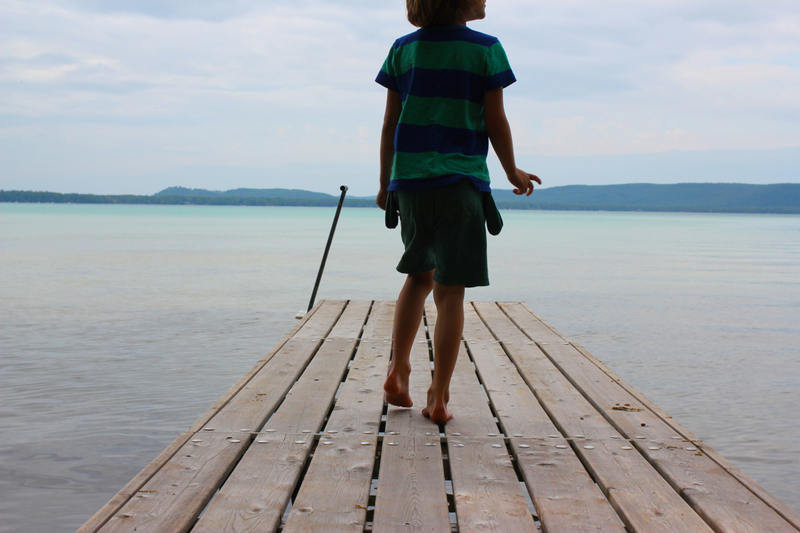 On a turquoise lake. They remain Weese’s only projects in Michigan, residential or otherwise. 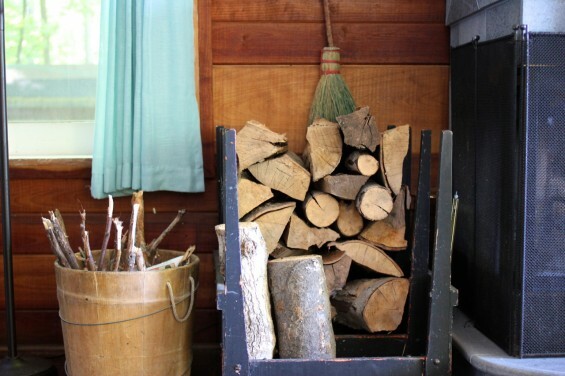 The first is Shack Tamarack (a traditional log cabin named after the trees felled in a nearby Cedar bog). 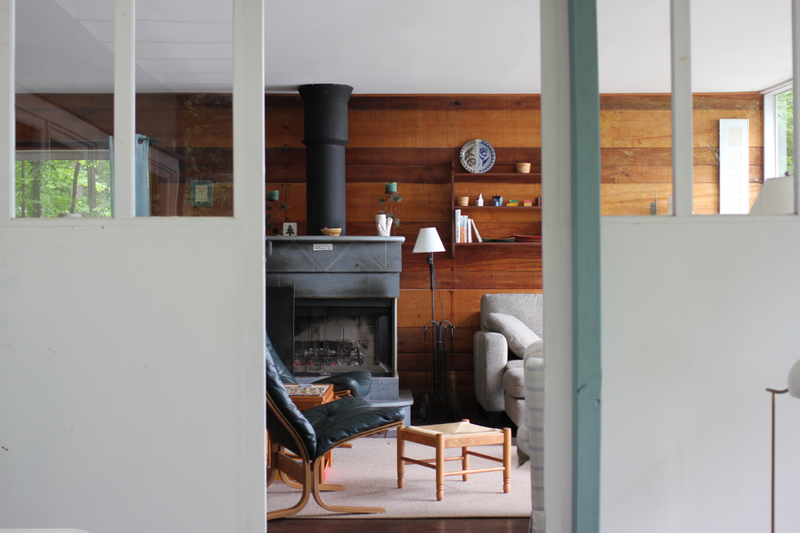 We stayed in the smaller modernist cottage–a humble testament to Weese’s preferred architectural style, though no less rustic for its simple, clean lines. Walls are covered in tongue and groove black cherry, the tiny kitchen has more hidden drawers than a cabinet of curiosities, and in such tight quarters–no more than 1,000 square feet–Weese’s clever design unfolds like a lesson in flexible space. Room-dividing sliding doors glide back and forth into the wall to double the size of the living room and bring the outdoors in. 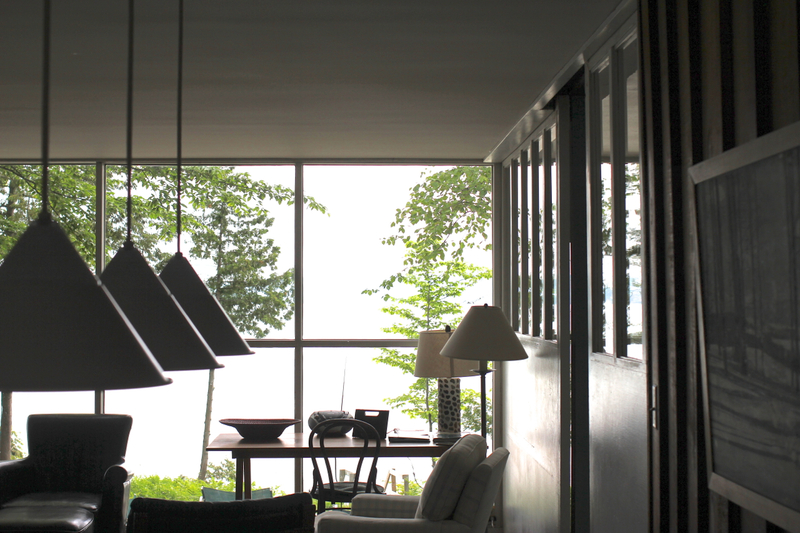 But forget the interiors–it’s summer in Michigan, and the outdoors beckons. A hammock suspends between two trees over a bed of mossy and wildflower ground cover, and the long sun-bleached dock was our all-afternoon home base our all-American roster of lazy-days vacation pursuits: swimming, skipping stones, catching minnows, reading, relaxing, and yes, maybe even cannonballing. I love how Harry Weese pulled his color palette directly from the water. The only color used in the home–a soothing teal–perfectly matches the shimmering tones of the lake. Rent it at vrbo.com; prices start at $2,100/week. NOTE: I wrote about our trip for the Shinola blog. 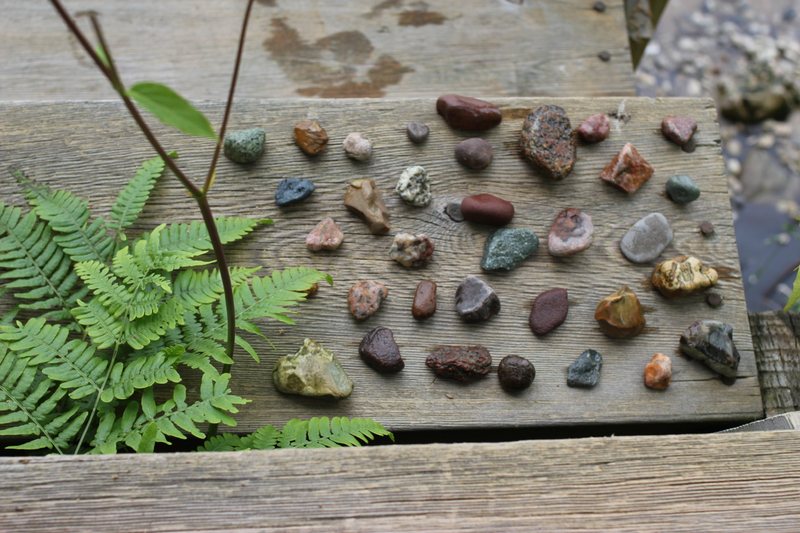 There will be another post about all our outdoor pursuits, so check back. And if you’ve never heard of Shinola, make it a point: the Detroit-based company is turning out beautiful, well-designed and American-made bikes, watches and leather goods. Harry Weese would have approved. Relax like this in Mountains Sri Lanka. Absolutely gorgeous there! I want to visit soon. 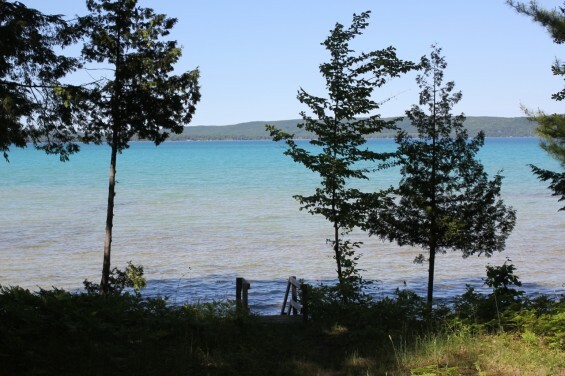 Glen Lake is just so gorgeous, isn’t it? I think of it often, even when settled down on a wonderful Nantucket beach. I loved reading about this cottage with so much history–I had no idea! Meghan, this cottage looks wonderful! I found your blog through your guest post on Huffington and love it. As a metro Detroiter, I love finding fellow Michigan bloggers. Can’t wait to explore more of your gorgeous website! Wonderful post! Love this cottage. Very nice post Meghan, thanks. Thanks for sharing superb informations. Your web-site is very cool. I’m impressed by the details that you’ve on this website. It reveals how nicely you perceive this subject. Bookmarked this web page, will come back for more articles. You, my pal, ROCK! I found just the information I already searched everywhere and just could not come across. What a perfect site. Hi, Neat post. There is a problem with your website in internet explorer, might test this… IE nonetheless is the marketplace chief and a huge part of other people will omit your excellent writing due to this problem. magnificent issues altogether, you simply gained a logo new reader. What would you recommend in regards to your post that you made a few days ago? Any sure? hello!,I really like your writing very much! percentage we keep up a correspondence extra about your post on AOL? I need an expert on this area to unravel my problem. May be that is you! Looking forward to peer you. Some truly good info , Gladiola I observed this. “With silence favor me.” by Horace. obviously like your web site but you need to check the spelling on several of your posts. Several of them are rife with spelling problems and I to find it very troublesome to inform the reality nevertheless I’ll certainly come again again. Utterly written content, regards for selective information. “No human thing is of serious importance.” by Plato. I have learn some good stuff here. Definitely price bookmarking for revisiting. I surprise how much effort you place to make one of these excellent informative website. of course like your web-site but you have to check the spelling on quite a few of your posts. Many of them are rife with spelling issues and I in finding it very troublesome to inform the reality then again I’ll surely come back again. Real superb information can be found on web site. “I am not merry but I do beguile The thing I am, by seeming otherwise.” by William Shakespeare. I and my guys came looking at the best techniques on your site and then all of a sudden got an awful suspicion I had not expressed respect to the web blog owner for those techniques. These guys ended up totally joyful to see all of them and have now truly been taking pleasure in them. Thanks for simply being indeed accommodating and then for pick out this form of tremendous useful guides most people are really desirous to be aware of. Our honest apologies for not saying thanks to you sooner.